RB 110 3WD skates is a nice step up skate for those wanting something tough, maneuverable and faster. RB molded boots are known to be durable and comfortable for all skating environments. The real step up is the 3WD frame which uses 110mm/85a Supreme wheels and SG7 bearings. 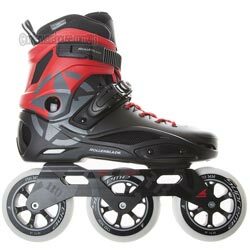 Combine the speed and control of this ride with molded boot technology and a secure closure system and skaters have an ultra-responsive, cool and versatile skate that beginner and intermediate users alike will appreciate. Brake does not come on skates like these but are available as aftermarket item (3WD Brake Support). Sizing Chart below is specific to Rollerblades.